Reading and share top 59 famous quotes and sayings about Peacock by famous authors and people. Browse top 59 famous quotes and sayings about Peacock by most favorite authors. 1. "Maggie threw her head back and laughed. 'So you're going to try...what? Birds of a Feather?' she quested. 'Of course not,' Kat said. 'Everyone knows the French government banned the importation of peacocks in 1987." 2. "How nice for you. Now I want you to promise me that if I move, you won't do something stupid." Macey was just starting to protest when Hale stopped and brought his hand to his ear. "Besides, there's someone who wants to talk to you." He held out the extra earbud, whispering softly in the too quiet room. "It goes in your ear and---"But before he could finish, Macey rolled her eyes and placed the bud in her ear. "This is peacock," she whispered.She watched Hale's eyes go wide as she heard a very familiar voice say, "You're not getting extra credit for this. Now"---Macey's teacher took a long, easy breath---"whats going on in there?" 3. "He loved three things in this life:Vespers, white peacocks,And old maps of America,Didn't love children crying,Raspberries with tea, Or feminine hysteria...And I was his wife." 4. "Yancey crawled from her tangled bed one morning and assembled her long limbs and sharp bones into something as exotic and seductive to the eye as a peacock or a griffin or a unicorn." 5. "At twenty a man is a peacock, at thirty a lion, at forty a camel, at fifty a serpent, at sixty a dog, at seventy an ape, at eighty a nothing at all." 6. "Being a peacock is not the only way to hide yourself, Frida. A pigeon can hide.--Lacuna"
7. "For all the feminist jabber about women being victimized by fashion, it is men who most suffer from conventions of dress. Every day, a woman can choose from an army of personae, femme to butch, and can cut or curl her hair or adorn herself with a staggering variety of artistic aids. But despite the Sixties experiments in peacock dress, no man can rise in the corporate world today, outside the entertainment industry, with long hair or makeup or purple velvet suits." 8. "If I was a painter, and was to paint the American Eagle, how should I do it?...I should want to draw it like a Bat, for its short-sightedness; like a Bantam. for its bragging; like a Magpie, for its honesty; like a Peacock, for its vanity; like an Ostrich, for putting its head in the mud, and thinking nobody sees it -' ...'And like a Phoenix, for its power of springing from the ashes of its faults and vices, and soaring up anew into the sky!" 9. "I wear white or pale-blue shirts and black knit ties: They don't draw attention to me in any kind of peacockish way." 10. "The house was quiet. Silently, I walked down the stairs and passed the peacock room where I found Mr. Kadam sitting and waiting for me. He took my bag and walked with me out to the car, then he opened my door, and I slid in to the seat and buckled my seatbelt. Starting the car, he circled the stone driveway slowly. I turned to take one last look at the beautiful place that felt like home. As we started down the tree-lined road, I watched the house until the trees blocked my view.Just then, a deafening, heartrending roar shook the trees. I turned in my seat and faced the desolate road ahead." 11. "In Paris the cashiers sit rather than stand. They run your goods over a scanner, tally up the price, and then ask you for exact change. The story they give is that there aren't enough euros to go around. "The entire EU is short on coins. "And I say, "Really?" because there are plenty of them in Germany. I'm never asked for exact change in Spain or Holland or Italy, so I think the real problem lies with the Parisian cashiers, who are, in a word, lazy. Here in Tokyo they're not just hard working but almost violently cheerful. Down at the Peacock, the change flows like tap water. The women behind the registers bow to you, and I don't mean that they lower their heads a little, the way you might if passing someone on the street. These cashiers press their hands together and bend from the waist. Then they say what sounds to me like "We, the people of this store, worship you as we might a god." 12. "Tell me of this Wizard Howl of yours". Sophie's teeth chattered but she said proudly, "He's the best wizard in Ingary or anywhere else. If he'd only had time, he would have defeated that djinn. And he's sly and selfish and vain as a peacock and cowardly, and you can't pin him down to anything." 13. "The world was so unbearably pretty, and it continued being so all the way down the mountain to school. I felt slightly high because of the beauty, and the inside of my head tickled. I wondered if this is how artists go through life, with all of its sensations tickling their craniums like a peacock feather.."
14. "Ah for pittie, wil ranke Winters rage,These bitter blasts neuer ginne tasswage?The keene cold blowes throug my beaten hyde,All as I were through the body gryde.My ragged rontes all shiver and shake,As doen high Towers in an earthquake:They wont in the wind wagge their wrigle tailes,Perke as Peacock: but nowe it auales." 15. "As to acknowledging that he was about to obtain a triumph with the ideas of another man, he never thought of such a thing. It is generally in perfect good faith that the jackdaw struts about in the peacock's feathers." 16. "I have tried imagining that the single peacock I see before me is the only one I have, but then one comes to join him, another flies off the roof, four or five crash out of the crepe-myrtle hedge; from the pond one screams and from the barn I hear the dairyman denouncing another that has got into the cow-feed. My kin are given to such phrases as, 'Let's face it." 17. 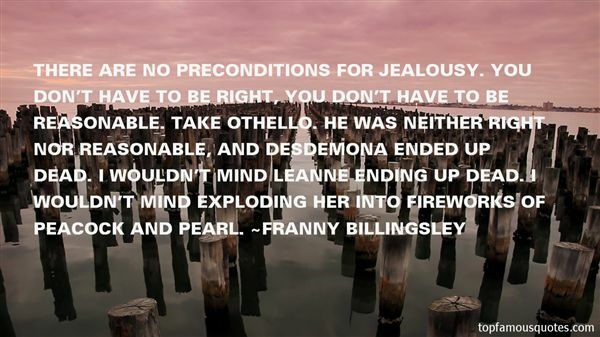 "There are no preconditions for jealousy. You don't have to be right, you don't have to be reasonable. Take Othello. He was neither right nor reasonable, and Desdemona ended up dead. I wouldn't mind Leanne ending up dead. I wouldn't mind exploding her into fireworks of peacock and pearl." 18. "He said that people who loved [animals] to excess were capable of the worst cruelties toward human beings. He said that dogs were not loyal but servile, that cats were opportunists and traitors, that peacocks were heralds of death, that macaws were simply decorative annoyances, that rabbits fomented greed, that monkeys carried the fever of lust, and that roosters were damned because they had been complicit in the three denials of Christ." 20. "And besides, in the end, perhaps love demands marble palaces, white peacocks and swans." 21. "If Truman hadn't published 'Answered Prayers' in parts, he'd have had the drive to finish it. The peacocks took it away from him." 22. "We followed him through the wealthy splendor of the house. Hardwood floors. Custom carved woodworking. Statues. Fountains. Suits of armor. Original painting, one of them a van Gogh. Stained-glass windows. Household staff in formal uniform. I kept expecting to come across a flock of peacocks roaming the halls, or maybe a pet cheetah in a diamond-studded collar." 23. "This is all quite fascinating," Grimalkin said, his voice slurring in my ears, "but instead of posing and scratching the ground like rutting peacocks, perhaps you should look to the girl." 24. "Somewhere there are gardens where peacocks sing like nightingales, somewhere there are caravans of separated lovers traveling to meet each other; there are ruby fires on distant mountains, and blue comets that come in spring like sapphires in the black sky. If this is not so, meet me in the shameful yard, and we will plant a gallows tree, and swing like sad pendulums, never once touching." 25. "Thinking back on the outing to the theatre, she added, ‘I want a man, not a preening peacock!" 26. "But unlike this book, the dictionary also discusses words that are far more pleasant to contemplate. The word 'bubble' is in the dictionary, for instance, as is the word 'peacock,' the word 'vacation,' and the words 'the' 'author's' 'execution' 'has' 'been' 'canceled,' which makes a sentence that is always pleasant to hear." 27. "Only you could love such a vile, selfish peacock, Evie." 28. "Then, at last, sitting on her stretcher-bed, she took from the very bottom of her pack an old peacock-blue scarf folded around a heavy, square book. She unwrapped it and opened it very carefully, as if guilty secrets might fall from between its pages like pressed flowers. This was Harry's secret. She was a writer." 29. "I'm a peacock Captain! 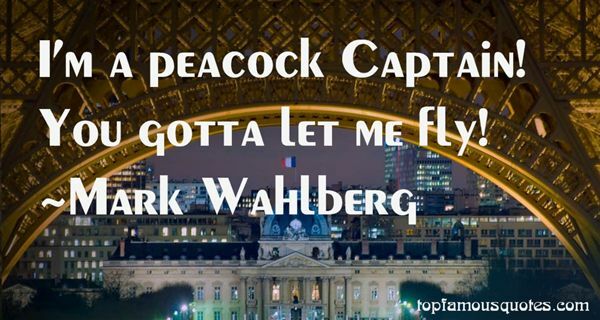 You gotta let me fly!" 30. "You're jealous of a bird?" she asks."What? No!" I snap. I just don't think I like peacocks very much. 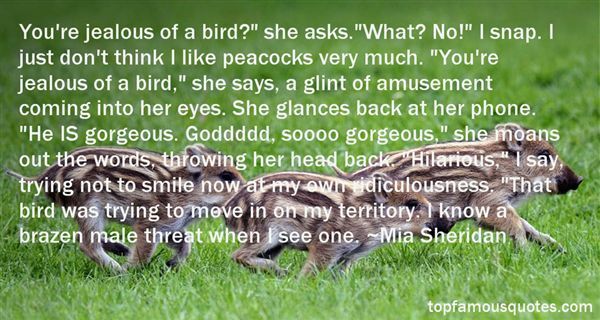 "You're jealous of a bird," she says, a glint of amusement coming into her eyes. She glances back at her phone. "He IS gorgeous. Goddddd, soooo gorgeous," she moans out the words, throwing her head back. "Hilarious," I say, trying not to smile now at my own ridiculousness. "That bird was trying to move in on my territory. I know a brazen male threat when I see one." 31. "Misery and pride. 'On horseback, death and a peacock'." 32. "A pair of schoolchildren,pale as rice and loud as peacocks,cut over the road and hurtled down a side street,galloping with joy or else with terror (p. 55)." 33. "I am still not talking to you," said Liza Hempstock's voice, proud as a peacock and pert as a sparrow. "Actually, you are. I mean, we're talking right now." "Only during this emergency. After that, not a word." 35. "She is a peacock in everything but beauty!" 36. "Miss Chauvenet." Morgan willed himself to speak his tongue near to tied.He was unable to take his gaze from her. She looked as fresh as springtime, her dark hair hanging in a braid beyond her hips, her eyes wide with surprise. Then her gaze moved over him, and he knew a moment of utter mortification.She's thinkin' you look like a peacock, laddie.With lace cuffs, silk stockings and drawers, and shoes with shiny brass buckles, he did look like a bloody peacock or, worse, like somoene that whoreson Wentworth would invite to his supper table. -Morgan"
37. "An example I often use to illustrate the reality of vanity, is this: look at the peacock; it's beautiful if you look at it from the front. But if you look at it from behind, you discover the truth... Whoever gives in to such self-absorbed vanity has huge misery hiding inside them." 38. "But if you could read my thoughts, you would be welcome to come inand listen to the story of my life. At least, you could slip your arm throughthe bars and touch me and I will hold out my forepaw to greet you, afterretracting my claws, of course. You are carried away by appearances - myclaws and fangs and the glowing eyes frighten you no doubt. I don't blameyou. I don't know why God has chosen to give us this fierce make-up, thesame God who has created the parrot, the peacock, and the deer, whichinspire poets and painters. I would not blame you for keeping your distance— I myself shuddered at my own reflection on the still surface of a pondwhile crouching for a drink of water, not when I was really a wild beast, butafter I came under the influence of my Master and learnt to question, 'Whoam I?' Don't laugh within yourself to hear me speak thus. I'll tell you aboutmy Master presently." 39. "Tell me again about the girl whose handshave no color. Whose hands are completelywhite. This time make them damned, oruntouched, or have her open a red umbrellaor point at some maple leaves and damnednear cry. Those hands. As freakish goes,I wish I had a tail. Maybe then you'd knowhow much I like you. It shakes me through,damn through. It shakes me. When she carriesa peacock feather. When she touches her neckor thighs. You're a person. It's not so bad.You have hands. You are a person with handsto hold things. Things you like. Tremendousthings. Tell me what you will hold today. Iknow there is room for everything. There is noneed to be ceremonious. Tell what gets let go." 40. "Be motivated like the falcon,hunt gloriously.Be magnificent as the leopard,fight to win.Spend less time withnightingales and peacocks.One is all talk,the other only color." 41. "Not truly living in the present moment and later regretting is like closing your eyes when a peacock is dancing, only to want to see it dance once it is gone. "-RVM"
42. "People are crying up the rich and variegated plumage of the peacock, and he is himself blushing at the sight of his ugly feet." 43. "Mizzenmast," bellowed Caldris, and Locke and Jean both fetched up short, breathing heavily. "Ship doesn't bloody have one," said Locke. "Just foremast and mainmast! ""Oh, clever you! You've undone my subtle ruse, Master Kosta. Get your bloody uniform and we'll let you act the peacock for a few hours." 44. "Everton" (Francis)Alex turned his head to view a rainbow peacock mask bobbing toward him. "Good Lord, Francis, you are replendent," he said admiringly.The peacock stopped beside him. "Dash it, Everton, how'd you know it was me? "You're still wearing your faux ruby ring." 45. "It was Christmas night, the eve of the Boxing Day Meet. You must remember that this was in the old Merry England of Gramarye, when the rosy barons ate with their fingers, and had peacocks served before them with all their tail feathers streaming, or boars' heads with the tusks stuck in again—when there was no unemployment because there were too few people to be unemployed—when the forests rang with knights walloping each other on the helm, and the unicorns in the wintry moonlight stamped with their silver feet and snorted their noble breaths of blue upon the frozen air. Such marvels were great and comfortable ones. But in the Old England there was a greater marvel still. The weather behaved itself." 46. "Dream tonight of peacock tails,Diamond fields and spouter whales.Ills are many, blessings few,But dreams tonight will shelter you.Let the vampire's creaking wingHide the stars while banshees sing;Let the ghouls gorge all night long;Dreams will keep you safe and strong.Skeletons with poison teeth,Risen from the world beneath,Ogre, troll, and loup-garou,Bloody wraith who looks like you,Shadow on the window shade,Harpies in a midnight raid,Goblins seeking tender prey,Dreams will chase them all away.Dreams are like a magic cloakWoven by the fairy folk,Covering from top to toe,Keeping you from winds and woe.And should the Angel come this nightTo fetch your soul away from light,Cross yourself, and face the wall:Dreams will help you not at all." 47. "How come it can't fly no better than a chicken?' Milkman asked.Too much tail. All that jewelry weighs it down. Like vanity. Can't nobody fly with all that [stuff]. Wanna fly, you got to give up the [stuff] that weighs you down. 'The peacock jumped onto the hood of the Buick and once more spread its tail, sending the flashy Buick into oblivion." 48. "Genius and virtue are to be more often found clothed in gray than in peacock bright." 49. "Patterns drawn in ultraviolet might make those ordinary little petals into the exotic peacocks of the botanical world, and yet we cannot appreciate them." 50. "Ruin, weariness, death, perpetually death, stand grimly to confront the other presence of Elizabethan drama which is life: life compact of frigates, fir trees and ivory, of dolphins and the juice of July flowers, of the milk of unicorns and panthers' breath, of ropes of pearl, brains of peacocks and Cretan wine." Inside me are the real things that give me strength--my thoughts, the small stones of my own choosing. They tumble in my mind, some polished from frequent turning, some new and rough, some that cut."